Spot the butter - Culured Whey Butter from Kappacasein, the Bermondsey diary that makes Bermondsey Hard Pressed and London Raclette. 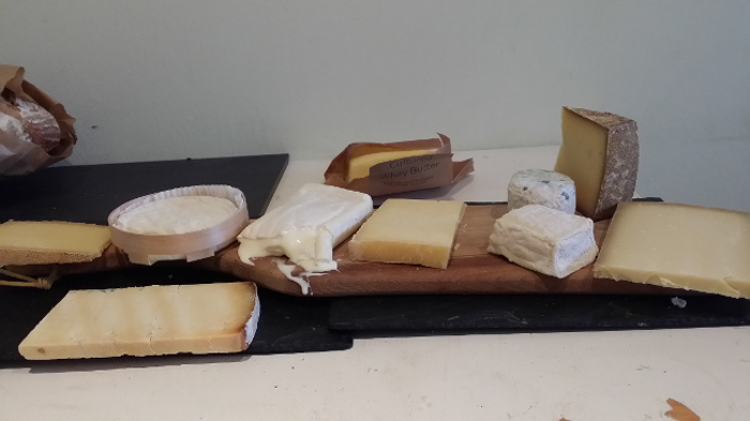 Ate these cheeses with a lovely 2014 Domain Combier Crozes Hermitage Clos de Grives. And had a debate with the wine snob who said it was wrong to drink cheap wines with good cheese. He also claimed that it was usually wrong to drink red wine with cheese. Now, I've not tried all that many combinations, but I can't ever remember thinking that a drinkable wine spoilt a good cheese, or vice versa. So I'm going to carry on regardless. Subscribe to this blog. Receive emails when new posts are published.